gallery house in concrete and pink. | owl's house london. gallery house in concrete and pink. A triple-height gallery housing a collection of prized paintings is concealed behind the wooden shingle facade of this house in Stuttgart. Like any well-designed gallery, the design is all about the internal spaces and how they play to the artworks that will embellish their walls. It is an inward looking house, with no long views. Rather, light and interior space are the game-players, allowing the artwork – a collection of old masters paintings – to take centre-stage. Gallery space and living spaces are separated. A massive concrete core, extending ever up through four floors, acts as the spine of the building, housing the stair, kitchen, bathrooms and services. 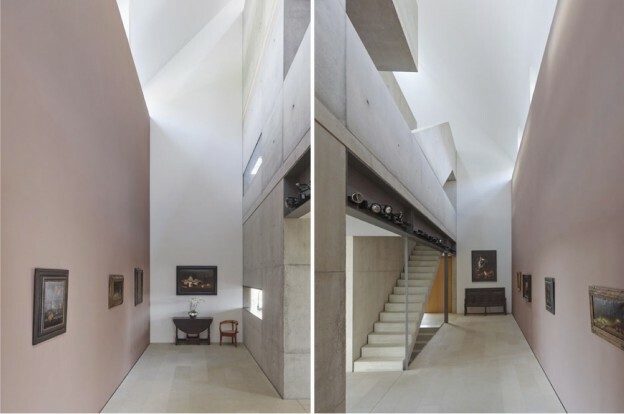 Clerestory windows bring light down into the gallery, while dedicated spotlights recessed into the concrete core on opposing sides light the artworks. 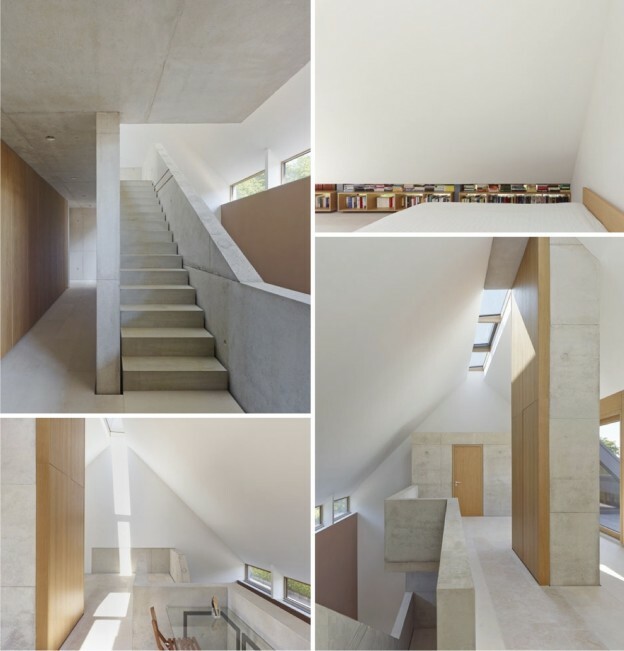 Skylights along the ridge of the roof allow daylight into the living zones. Walls are painted in a curious dark shade of pink, which works beautifully against the raw concrete. Joinery, doors and bookshelves slotted into recesses add texture and warmth. This entry was posted in wonderful spaces. and tagged (se)arch Architekten, architecture, artworks, design, gallery, gallery space, Stuttgart on February 10, 2014 by owls house london..